Andrew here. Last month, my brother and I took a trip to Mt. Rainier, Washington. This is a favorite destination of ours when out West, and this year we got to spend a couple of nights on the mountain. This also meant we got a couple of sunrises and, since my brother is himself an excellent photographer, it wasn’t too hard to convince him to get up at dawn and visit the famous Reflection Lakes. We got up before sunrise, as landscape photographers are cursed to do, and were in place when the sun hit the mountain. We had uncharacteristically clear skies both mornings, which meant almost no clouds to catch the morning light and color. While we did get some good reflection shots, I took a more important lesson away from this opportunity: Even if you know what you’re there to shoot, keep your eyes open. This shot of the treeline and rising sun reflected in the lake is the result of looking to my right, away from the mountain, and realizing this was the shot that really made the most of the atmosphere and light at that moment. I did take shots of Mt. Rainier reflected in the still waters of the lake, but the fact that you’re seeing this shot first should tell you something — the famous scene you went there to shoot isn’t always going to be your favorite shot of the visit, so keep your eyes peeled for what else is around you. You might be surprised. The thing I love about compositing is that it gives me an excuse to take pictures of just about anything, anywhere. I’m not a landscape or nature photographer (I leave that to Andrew), but you never know when you might want a particular scene as a background. Thus when we went on vacation to the Olympic Peninsula last year, I found plenty to keep me busy while Andrew and his brother were shooting waterfalls and epic forest scenes. Alas, the rainforest was not as cool and lush and rainy as we’d hoped… in fact, it was hot and dry. We were also hoping for overcast skies, but we got sun with hardly a cloud in sight. Most of our photographs were taken in the middle of the day, since we had more places we wanted to visit during our brief stay than we had golden hours (and it was a vacation, so I admit, we were often lazy in the mornings). In summary, we had hoped to capture magical green rainforests, but we ended up with a lot of brown and some very harsh light. It was still lovely, but it wasn’t quite what we’d been dreaming of. 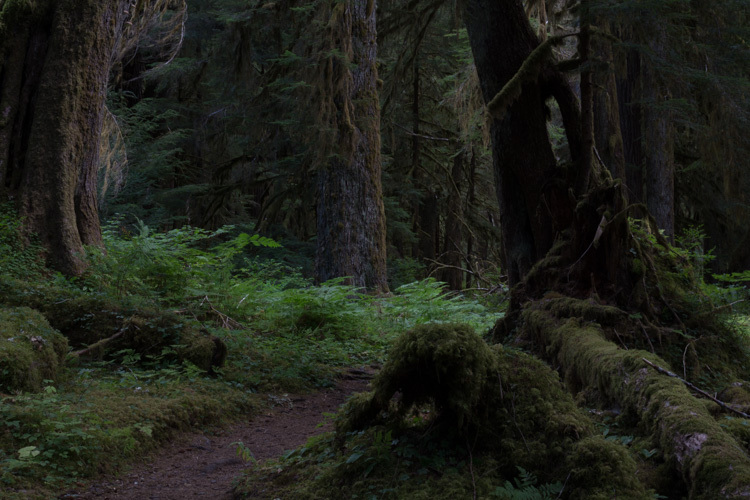 Below is one of my better straight-out-of-camera shots… I spent a lot of time at this bend in the path because that mossy lump next to the trail looked like some kind of beastie, and I knew I’d want to play with it later. The out-of-camera background looks pretty flat, but it has good bones. With a lovely and interesting subject, some Orton glow, color toning, and a little straight-up magic, it turned into something that makes me smile to look at. Goes to show that saving pictures comes in handy sometimes, even you don’t quite know what to do with them at the time. The dense evergreen forests on the slopes of Mt. Rainier come alive when it rains. The immersiveness of a forest rainstorm leaves me with a feeling as if I have traveled back in time. The rain seems to separate you from the outside world and you realize that this forest is as it was millennia ago, and will be millennia from now, if we protect it. This is the Earth as it really is; and out here, you’re just another part of it, not the master of it. This shot was taken along the Lower Lakes Trail in Paradise Valley on Mt. Rainier, Washington. We hiked up from Paradise Lodge along the Skyline Trail, followed the Mazama Ridge trail down the south side of Rainier, and decided to cut back in the general direction of Paradise Inn when a storm rolled in, taking the High Lakes Trail back West. It was hard to resist shooting scenes like this along the way, as the streams swelled from the rainfall and the forest took on an otherworldly feel with the clouds settled in the trees.